Adventure Time #71: Double Troubles Part 2 is a solid continuation of Part 1, where Finn and Jake made a deal with the Wish Witch. The two central heroes from Adventure Time signed a contract that lets them use a pair of their own doubles to manage heroism in the Candy Kingdom, while they have fun at an adventure theme park. As the series title indicates, something seems a little strange about the situation. The great writing from Kevin Cannon makes it easy to hear the voices of Finn, Jake, and Princess Bubblegum while reading the story. Joey McCormick’s illustration and Maarta Laiho’s colors transport the reader to the land of Ooo with skill and a clear affection for the subject matter. This is an Adventure Time story that begs for part 3 to be released. This issue, everything is falling apart. The skeksis are nearly triumphant. The gelflings are getting their asses kicked. Jen turns back to protect Kira rather than press on to save the fireling and keep the shard of the Dark Crystal out of skeksis hands. Everything is bad! Except Tumby, the weird bulbasaur thing, which is apparently the only creature in Thra that knows how not to be an idiot. Everything is awful, but the seeds of victory for the good guys are starting to sprout. The last few issues of this story should be wild. Dark Crystal fans with kids can look forward to March 2018, when BOOM! 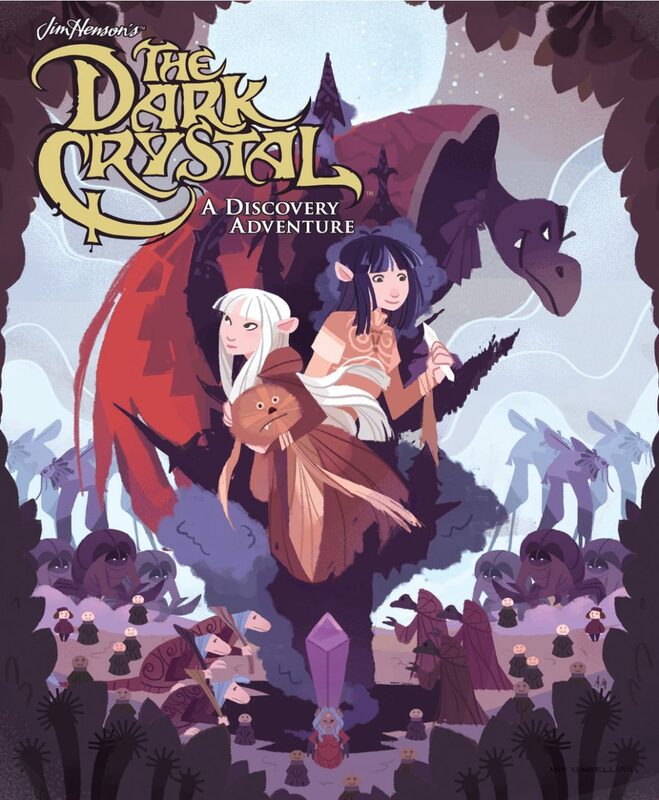 through Archaia put out Ann Marcellino’s visual puzzle adventure book (cover below). Spot crystal shards, etc. A nice thing for a quiet afternoon. The other licensed book for the week of Wednesday, December the sixth, Rocko’s Modern Life #1 (KaBOOM!) remains unassigned. I myself cannot read it, as I always found the show quite upsetting. Like something that grew in the dark. What’s with that cow, man? It’s ugly. But the colours on this cover are very now, and very BOOM!, so whether you saw the twenty-four year old show or not … you might like this comic. Don’t ask me. Hey, remember Rocko’s Modern Life? Well, it’s back, in comic-form on Kaboom. Everyone’s favorite animated wallaby is back, dealing with a new set of troubles in this modern life. Some of the details are slightly different but you can still hear Rocko’s Aussie accent as he optimistically tries to keep afloat and care about his friends (SPUNKY. HE’S STILL GREAT). The art is clean(er than I remember the cartoon being) but still brings that grotesque, surrealness that makes you laugh at how real that stress really is. Much like the show, a vast majority of the characters are male (though Dr. Hutchinson does pop up), but as a first issue is a good reminder that modern life, whether Rocko’s or not, is absurd, colorful, stressful and good for a laugh. 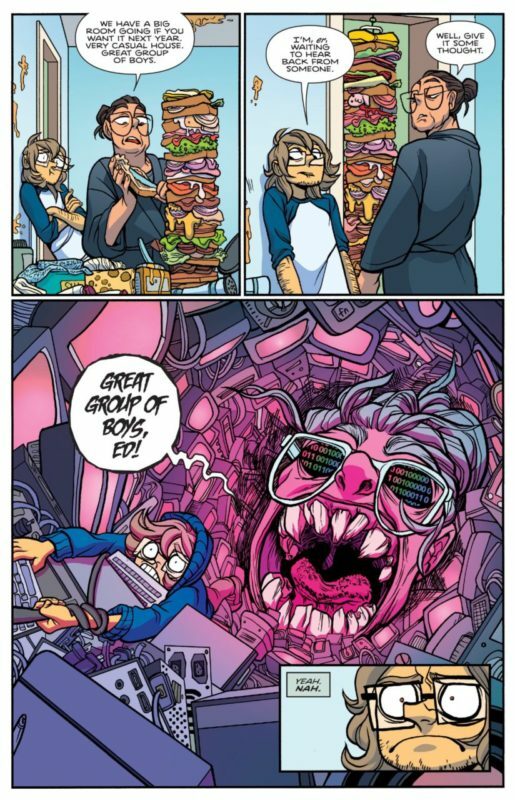 Giant Days arrives neatly at the mark implicitly promised last issue: should Ed Gemmel invite Esther to live with him? Should he?? Ed, you’ll die if you fly into that flame. But there are things worse than death… We’re also gifted with promise for next issue (such a neatly done periodical, this!) wherein Esther’s bestie from back home is set to visit—and who may she bring but her sister, mystery fiend Charlotte Grote? Scary Go Round/Bad Machinery fans, if you’ve been sleeping on Giant Days your time of reckoning draws near. Bah Humbug, it’s me, the Grinch! Dan Mora (regularly seen on other BOOM! Projects like Power Rangers and WWE) and Grant Morrison force Butch Santa on us once again. This time for the “Crisis in Xmasville.” Mora should be congratulated for executing a flawless “this is the nineteen eighties” establishing panel before the next one’s caption states it outright; Molly Ringwald (est. 198X) Jubilee (est. 1989) and that baby the Olsen Twins played on that sitcom (est. 1987) are all lined up together in the back of a car. Bang (BOOM! ), it’s 1985. Yadda yadda Stranger Things joke. The choice of watercolour-textured colours rather than shiny digital gradients is a lifesaver—takes all the false dazzle of expected “comic book” machismo right away and makes the damn thing quite readable, actually. Mel Caylo has left his position at BOOM! ; that, for comics at large, seems potentially fairly bad. Caylo was BOOM!’s Marketing Manager—marketing being the top job “in comics” that almost nobody seems to noticeably do. Caylo’s regular emails, coupled with the notably fantastic BOOM! press copies supply system (the best✨ of all publishers’—how do you think I manage, or am willing, to do these columns weekly? It’s because their access system is IMMACULATE) were always clear and concise and excessively practical. Caylo’s tenure has seen us all writing “BOOM! Studios” instead of the far more reasonable “Boom Studios”; an admirably iron grip on branding. Exactly why he leaves is thus far a mystery. But let’s be real, it’s a bad industry with terrible economics, so it’s probably something unfair or distressing. 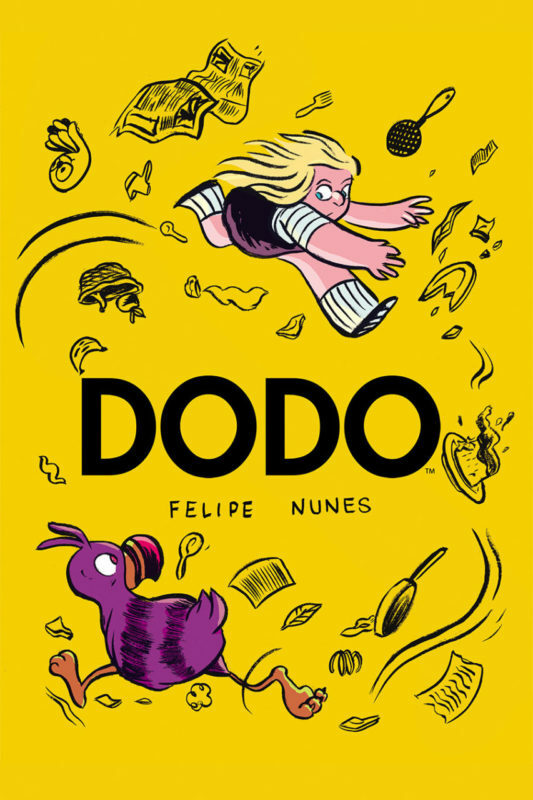 The cover is very compelling, full of exciting yellow and eye-connection and motion; exactly the opposite, in fact, of “sad.” I think that’s a good sign. Things are broken, and in a state of chaos, but nothing has ended. 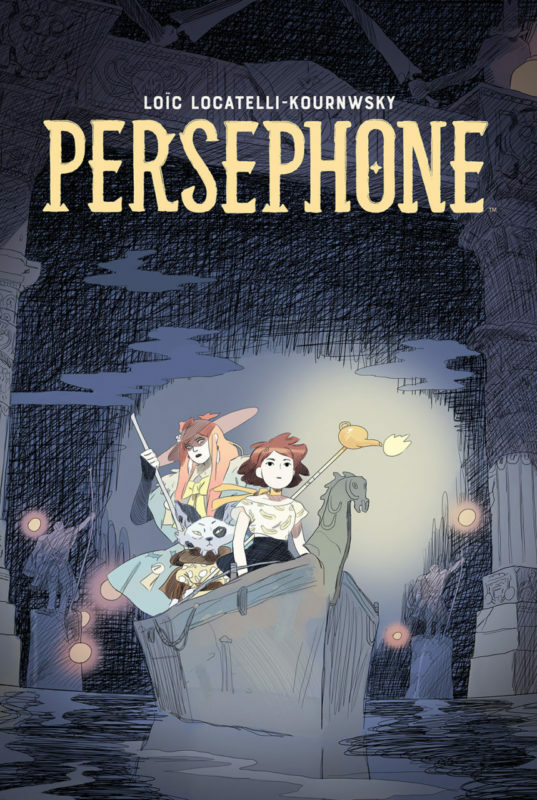 And in May, a book that almost directly follows DODO: Persephone, A Persephone-Demeter relationship retelling by Loïc Locatelli-Kournwsky. A girl tries to come to terms with where she places in the context of her magnificent single mother; a coming of age story metaphorically post-divorce. An extremely beautiful cover—let’s enjoy the potential here! Hey hey it’s the nineties, so we’ll just nineties around—Power Rangers is going full ridic in March for the 25th anniversary of Power Rangers. Yeah! Twenty-five! You’re so old!! 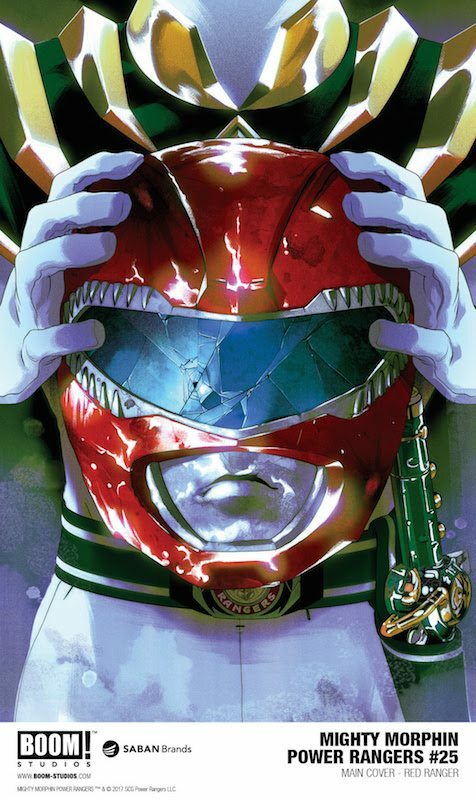 Mighty Morphin Power Rangers #25 will be “featuring events so shocking that the issue will be sealed in a black polybag to prevent spoilers!” Oh magaw, alright, if you say so. It’s cute, I guess. Anyway here’s the cover that you won’t be seeing through that black polybag, so you can recognise it in the wild and not peep over the shoulder of whoever. Because Spoilers. Are. Bad.